Sunderland moved out of the Championship relegation zone with a win at Nottingham Forest. Forest striker Daryl Murphy missed three presentable chances before Adam Matthews crossed for Aiden McGeady to power in a header. The hosts had three shots on target to the Black Cats' one but couldn't find a way past goalkeeper Robbin Ruiter. Chris Coleman's third win in eight Championship games helped Sunderland move past Burton into 21st place. 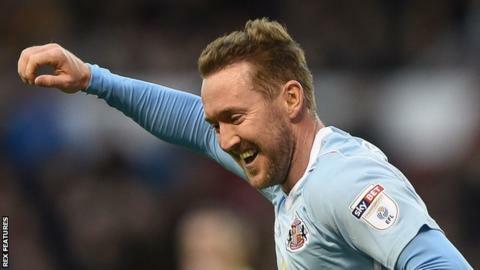 McGeady's goal was Sunderland's only shot in the entire match, with the absence of injured top scorer Lewis Grabban felt up front. However, the away side were comfortable sitting deep and were not made to pay by Forest, with former Black Cats striker Murphy particularly guilty of spurning chances. Ruiter was out quickly to block the Irishman's first attempt, but Murphy also guided a diving header wide and put another over the bar from close range. With Bolton winning at Sheffield United, Birmingham beating Leeds and both Barnsley and Burton picking up draws, the win became even more significant for Coleman's team. "It was very similar to the last game [against Sheffield Wednesday] in that we created chances, but did not put them away. "We had a couple of headers in particular that were three, four or five yards from goal. You have to put those in the back of the net and we did not. "Then we find ourselves 1-0 down to a team we knew would fight and who would sit in with 10 men behind the ball. That is hard. They were solid and compact and you cannot lose patience." "Three points is all that matters. We had to do something different to what we did in the last game - and I thought the guys were brilliant. "I was critical of us after the last game but, this time out, I was so proud of our players. They were absolutely brilliant. "It was the organisation and communication. Some of the defending was stunning. I thought all the lads were absolutely fantastic." Match ends, Nottingham Forest 0, Sunderland 1. Second Half ends, Nottingham Forest 0, Sunderland 1. Eric Lichaj (Nottingham Forest) hits the left post with a left footed shot from the centre of the box. Assisted by Kieran Dowell. Attempt missed. Michael Mancienne (Nottingham Forest) header from the centre of the box misses to the left. Assisted by Ben Osborn with a cross following a corner. Corner, Nottingham Forest. Conceded by Marc Wilson. Attempt blocked. Eric Lichaj (Nottingham Forest) right footed shot from a difficult angle on the right is blocked. Attempt blocked. Eric Lichaj (Nottingham Forest) left footed shot from the right side of the box is blocked. Assisted by Kieran Dowell. Attempt blocked. Jason Cummings (Nottingham Forest) left footed shot from outside the box is blocked. Attempt blocked. Kieran Dowell (Nottingham Forest) header from the centre of the box is blocked. Assisted by Ben Osborn with a cross. Corner, Nottingham Forest. Conceded by Adam Matthews. Bryan Oviedo (Sunderland) wins a free kick in the attacking half. James Vaughan (Sunderland) wins a free kick in the attacking half. Attempt missed. Ben Brereton (Nottingham Forest) header from the centre of the box misses to the left. Assisted by Jason Cummings with a cross. Substitution, Sunderland. Bryan Oviedo replaces Aiden McGeady. Armand Traore (Nottingham Forest) is shown the yellow card for a bad foul. Foul by Armand Traore (Nottingham Forest). Donald Love (Sunderland) wins a free kick in the defensive half. Attempt missed. Ben Brereton (Nottingham Forest) right footed shot from the centre of the box is close, but misses to the left. Assisted by Mustapha Carayol with a cross. Foul by Jason Cummings (Nottingham Forest). Offside, Sunderland. Darron Gibson tries a through ball, but Aiden McGeady is caught offside. Corner, Sunderland. Conceded by Mustapha Carayol. Substitution, Sunderland. Lynden Gooch replaces Callum McManaman. Attempt missed. Ben Osborn (Nottingham Forest) left footed shot from outside the box is high and wide to the left. Assisted by Eric Lichaj. Substitution, Nottingham Forest. Jason Cummings replaces Daryl Murphy because of an injury. Substitution, Sunderland. James Vaughan replaces Josh Maja. Delay in match Daryl Murphy (Nottingham Forest) because of an injury. Corner, Nottingham Forest. Conceded by Donald Love. Attempt blocked. Kieran Dowell (Nottingham Forest) left footed shot from outside the box is blocked. Assisted by Ben Osborn.